Bah Humbug! This Scrooge REALLY Means It! Academy Award winning director Robert Zemeckis brings us this classic tale in motion capture animation. To refresh your memory, Zemeckis is the director for all of the Back to the Future films,Forrest Gump, The Polar Express and Beowulf. He’s a Chicago native and was here in July 2009 on a promotional press tour for the film. He spoke mainly to an audience of press media stating that he is devoted to the process of motion capture and will continue to enhance its capabilities. Union Station was decked out with Christmas decorations, strolling carolers and a train that contained information about the production of the film. 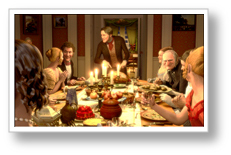 Motion capture is a process in which the characters are dressed in all white and have dots or markers coated with a retroreflective material to reflect light back that is generated near the cameras lens. The camera is adjusted so only the bright reflective markers will be sampled, ignoring the skin and clothing of the actor. Jim Carrey, who plays Scrooge in the film, wore a specially-designed suit for filming. Later, animators draw in his features and the background. The main complaint about the film Beowulf is that the eyes of the characters weren’t expressive enough. All of the facial expressions and eyes in this film are top notch; Zemeckis has definitely nailed it! The film is grand in scale and dramatic to be sure. My viewing was at the IMAX in 3D and very enjoyable. This Scrooge is the darkest and meanest I’ve experienced thus far. He even has black circles around his eyes. He’s bitter, angry, stingy, cruel, uncaring and downright shameful. Clearly a despicable character indeed. His speech is snarly with lots of grunts and sighs. This is certainly a very dark Scrooge. 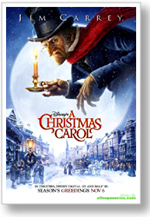 The story is centered on the Charles Dickens tale of time-travel as Scrooge is visited by three ghosts who show him the past, present and the future. These ghosts are frightening as well. The recommended age for this film would be 9-years-old and up. Younger children could be easily frightened by Scrooge and the ghosts. The ghosts are supposed to frighten this dark Scrooge, so you can imagine the fright factor in this tale. The ghosts are loud and scary, although they are a bit strange-looking. The first one is shaped like a candle with a flame for a head and is very small, but very loud. The second one is a gigantic Father Christmas-type ghost. The third one is mainly black and doesn’t have much screen time. By far my favorite scene is the Feeziwig dance. Mr. and Mrs. Feeziwig are portrayed wonderfully as their dancing talents are displayed in over-the-top animation. They both spin like tops to the ceiling and back down again! Colin Firth is in the film and he actually looks like himself; which is eerie. You’ll no doubt appreciate the special effects as Scrooge flies over London at top speed and the ghosts have several tricks up their sleeves to amaze us. All in all, this film was an enjoyable adaptation and one that can be viewed as a family; just leave the tiny tots at home or you may have children that will be frightened of Grandpa from now on!